Hello! My name is Eric, and I specialize in the removal of honey bee hives from homes and other buildings. I am based in San Diego, CA, and service most of the area, including Oceanside, Escondido, Encinitas, La Jolla, El Cajon, and Chula Vista. I operate a fully licensed and insured pest control business in the state of California. I have the best bee removal equipment and training available, and I have the best insurance and licensing available as well. I have a great advantage over the large pest control firms - first of all, I do better work than them, hands down. If you hire a big bug company, you'll get an underpaid employee who doesn't really care of the job is done right. If you hire me, I will arrive at your house, and do the job correctly and professionally, from start to finish. I have 5 years of bee removal experience, and I am available 24 hours a day, 7 days a week. Give me a call! Honey Bee removal is not a trivial matter. Well, first of all, it's important to properly identify the bee species that you have in your home or building. Different insects require different approaches. I am fully trained and equipped to deal with all nuisance stinging insects, but the Honey Bee, of the genus Apis, of which there are several species, including the Africanized Killer Bee, which has invaded California, require special care. You can't just use a poison control solution when it comes to honey bees. Poison does work for several species of insects. But Honey Bees must be removed by hand, and the entire hive must be removed. This is why these special bee suits and equipment are manufactured in the first place. You've got to remove the entire hive, because a beehive may be comprised of several thousand, even tens of thousands of bees. Not only that, they create a large network of wax honeycombs and honey. If you don't remove the whole hive properly, you'll have a few problems on your hands. First, new bees will find the hive. Second and more importantly, you'll have a huge pile, sometimes hundreds of pounds, of wax and honey and dead bees festering inside the building, and leaking a stinky mess everywhere. We are based in San Diego California. We operate 24/7, and strive for the highest level of customer service - we show up as scheduled, in clean truck and uniform, and we use the best equipment. We offer a full written guarantee on our work, and provide a full range of services for all of your bee control needs. We put a great deal of care and pride into our work, and make sure that the bee problem is gone for good. 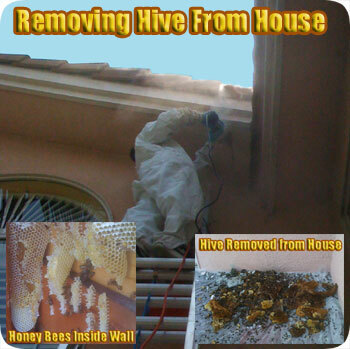 Superior Bee Removal: We have trained for years specially on bee control and hive removal. Our experience counts a great deal when it comes to properly understanding the species of bee, and the type of hive that you are dealing with. My knowledge of architecture means that I am specially prepared to properly disassemble the area in order to remove the hive in its entirety, and fix the open area afterward. Bees can live in walls, roofs, attics, chimneys, soffits, under decks, and several other areas. They can even live as a swarm outside of a building, and each different area requires a different approach in order to get the job done right. 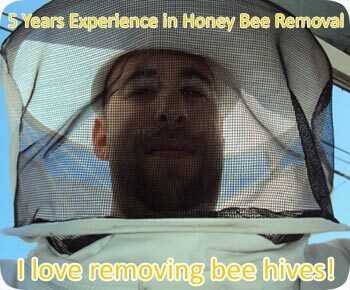 I have been known to remove some hives as high as 60 feet off the ground! Not every bee removal company can do that. But more importantly, not every bee removal company is owner-operated, providing both the best level of service, and competitive rates, below that of the big companies and their unmotivated employees. Give me a call at 619-313-4122, and we'll schedule an appointment. We service greater LA, CA including the towns & suburbs of Oceanside, Escondido, Encinitas, La Jolla, El Cajon, and Chula Vista and the entire metropolitan region. We will also travel for bee removal projects in any part of the state.